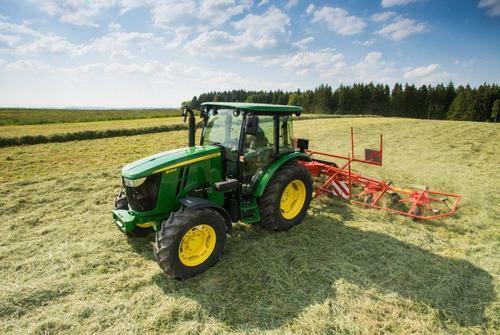 With its new line-up of small tractors, John Deere is addressing the needs of the small-scale farming sector, from arable, livestock and mixed farms to speciality crop producers and even part-time farmers. These models include the 4M and 5E Series three- and four-cylinder tractors from 49 to 95hp. Filling the gap between John Deere’s 3E Series compact utility tractors and the updated 5E Series models (see below), the newly designed 4M Series combines high levels of comfort and low cost. The 49hp 4049M and 66hp 4066M are versatile mid-specification tractors for agricultural applications where a narrow, low-profile compact tractor is needed. They are also suitable for large property maintenance and commercial applications such as landscaping, as well as part-time farming. Powered by a four-cylinder turbocharged diesel engine, both the 4049M and 4066M are equipped with a highly efficient and easy-to-use 12x12-speed transmission. This features an electrically engaged power reverser to enable simple changes of direction at the press of a button. As a result, the easier and faster shifting helps to save fuel and reduce operating costs. The ergonomic flat floor open station operator platform is easy to access and features a foldable ROPS, which allows the tractor to be parked in a normal garage. The independent PTO sets the 4M Series tractors apart from similar competitive products and can be engaged on the go without stopping or pressing the clutch pedal, for extra versatility and comfort during PTO operations. Both tractors have a maximum lift capacity of 1400kg, enabling the operation of a wide range of implements, including an optional, easy to attach John Deere front loader. Designed primarily for use on livestock and small arable farms, John Deere’s 5E Series three-cylinder tractors (55, 65 and 75hp) are also suited for municipal and landscaping applications. They will continue to be powered by Stage III A engines for 2014. By contrast, the new larger four-cylinder 85 and 95hp versions will feature Stage III B diesel-only PowerTech engine technology. Equipped with a spacious cab or easy-to-access open operator station, 5E three-cylinder tractors are now also available with a 12x12-speed power reverser in addition to the existing 9x3 synchronised transmission. Its 12 speeds between 2 and 38km/h (1.2 and 24mph) offer a wider selection of gears for each application and can reduce fuel consumption while driving at lower engine revs on the road. For quick and easy headland turns, the clutchless reverser also provides a more comfortable solution. A separate control enables the operator to change the reversing speed from fast, for headland turns, to slow, for precise front loader work and easier manoeuvring in tight spaces. An electro-hydraulic PTO button also helps the operator to quickly engage and disengage the PTO during headland turns when working with a power harrow, rotary tiller, rake or other PTO driven implements. The three-cylinder 5E Series tractor cab features a tiltable and telescopic steering wheel for improved accessibility and driving comfort, a tilting passenger seat with optional safety belt and an onboard computer on the power reverser models to control driving speed and engine rpm. John Deere’s new four-cylinder 5E Series tractors are equipped with a PowerTechE 4.5-litre high pressure common rail (HPCR) engine, which is highly responsive to load changes. This diesel-only engine is Stage III B compliant and uses diesel oxidation catalyst and diesel particulate filter technology. Two transmission options will be available on these new models, the 12x12-speed power reverser transmission for speeds up to 35km/h (22mph) and a 24x12-speed power reverser HiLo transmission for a maximum speed of 40kmh (25mph). They both feature a durable wet disc clutch and an oil-cooled and wet power reverser for directional changes without using the clutch. With the optional power reverser modulation feature, operators can infinitely adjust the speed of directional changes. A creeper gear option for a minimum speed of 0.3kmh (0.2mph) is also available, for vegetable producers and others requiring extremely low forward speeds. The four-cylinder 5E Series tractor models are fitted with a spacious TechCentre cab similar to the 5M Series, which includes a mechanically suspended seat, fingertip MFWD engagement and a fixed windscreen with good visibility to front implements. A premium air suspended seat and a passenger seat with seat belt are available as options.